Have you been curious about the "hair care" we have been raving about? This is a bit personal, but I am sharing my experience in hopes to help others! So I have been struggling with MASS hairloss for years now. I use the best hair care possible yet still have had no positive results. Being in the public I am always worried about my hair and its health for the long haul. Especially since for the most part of my life I have had long, thick hair. SO I stumbled across this picture(below) and read about it and had to try it. I just wanted crazy results like hers even though I didn't know what those results would be. This customers 2 WEEK results using the... Monat Let It Grow system! 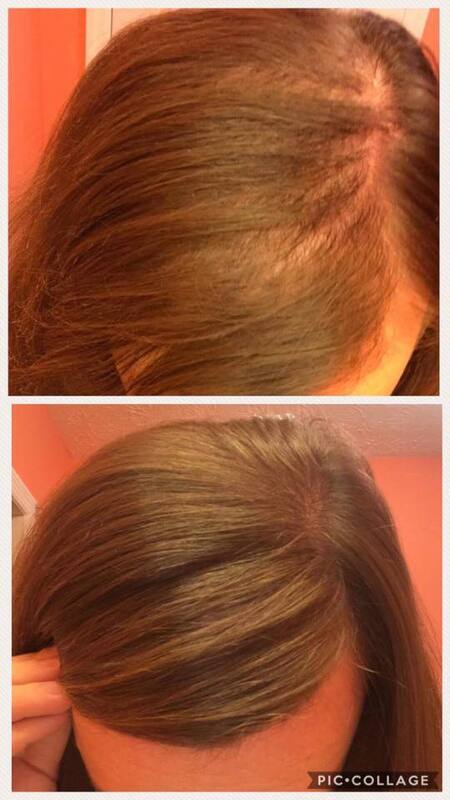 She has hypothyroidism and it causes her hair to fall out and not grow quickly at all. Her color is even more vibrant and her hair is shiny! No color has been applied! These next results are Larry's personal results. Before Monat, he had tried Rogaine and others and not had any success with them. Now after 4 weeks of using the men's Black Shampoo plus the IRT spray, look how much his hair has already grown in. Its crazy how this stuff actually works and works quickly. My hair, when I went to get it colored this last time, she said I actually had a lot of baby hairs growing in. Which is awesome. I can't wait to see how my hair looks in a few months from now.